Well, here at the Library like so many other homes and places, things have been a little wet. A number of programs have had to be cancelled or scheduled to a different location. The 4H BABYSITTING COURSE will be held Wednesday & Thursday, April 21 & 22, at the First Church of Christ next door. Thank you, First Church! If you are interested, just an FYI, the actual cost of the class here in Sandwich is $15 as the Friends of the Library have helped us reduce the fee. In years past the course was free but due to budget cuts, the Extension Service has to charge for presenter’s time. Still a very good deal. Go to the Events Calendar to sign up. Back to the deluge…we’ve being doing ‘adpative storytimes’ and your friendly Teen Reads Area transforms into kinderstory land. It’s working quite well. Thank you to all for their patience because we know that is a great study area for adults in the morning. But life MUST go on at the library. It will be awhile before the downstairs can host its Toddler Storytimes, Adult book groups, MCBA, Preschool storytimes, cooking classes, game nights, puppet shows, adult programming, meetings for the public, staff lunches, Discovery Center programs/service, movie groups, summer programming for all, hockey nights – oops, we’ve never really done a hocky night at the libary – well, you can read and concur that the Library has been a busy place downstairs as well as upstairs. All shall be well and all shall be resolved, but for now….we need you to keep on coming, offer help, ideas and help us flaunt what we have. Don’t ya think? This month’s meeting has a focus…a camera focus. We’re doing ‘mini-mercials’ for the library from the TAG members viewpoint. Nothing fancy just a start at using the media for getting the point across about how the library & literacy matter to these TAGgers. Look for more ‘moving pictures’ on the blog…another bite of the literary Sandwich. Just a request….consider receiving new posts automatically with the little button next door….email subscription. Why….hmmmmm….just because it’s nice. AND, due to the flooding&pooling downstairs, the library needs to revamp EVERYTHING to do with programming. Yes, we are ON IT and all shall be well but for now, adaptation is the name of the game. Thanks for reading, thanks for being….library patrons. I know this isn’t the place for book reviews but I am adding a little of a rant to it, so here we go…. The movie ‘Ground Hog Day’ has Bill Murray reliving the same day over and over UNTIL he gets it right (which he does). 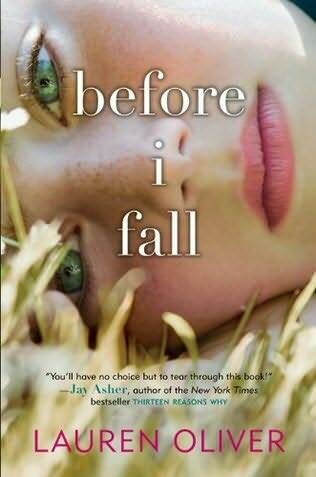 Before I Fall uses the same premise and believe me, it doesn’t fatigue the hook. Samantha Kingston leads an ordinary day of being with friends, feeling powerful, being popular, verbally power downing lesser mortals not in the friends’ realm of gloriousness until her day and life end after leaving the big party….and then, she’s wakes up again only she KNOWS she’s dead and can’t figure out what the hec is happening and why she’s reliving the day again – February 12th, ‘Cupid Day’ at Thomas Jefferson High. Dead teenagers talking about the experience is not new. There’s Cynthia Rylant’s Heavenly Village and Gabrielle Zevin’s Elsewhere and others. What’s different about this book? The writing is true and as the day is relived (7 times), ‘Sam’ gets a clue of who she is (or was) and who her friends, family & casual acquaintenances really are…what they mean to her, what they mean to themselves, what really matters in the end. There is a lot of dissing talk and discussion of sexual situations ( not explicit) and the angst of dealing with choices, the ‘party’ culture and dls (daily life stuff) which could be seemingly unimportant, but then maybe not. The characters and dialogue take you in and no one seems ‘made up.’ There are male characters in the book,too, who are as complex as the girls. I highly recommend reading this title (9th grade & up). If you have friends, if you have enemies, if you’ve every changed your mind about someone or something, if you’ve ever made ‘the biggest mistake EVER’ and still recovered, you’ll resonate with this story. It is an ‘upper’ but not in the usual sense. And, a head’s up on this one, the author may be coming to Sandwich for a visit, courtesy Titcomb’s Bookshop. I’m keeping my fingers crossed she does. Just back from the 7th Annual Children, Youth and Families Summit “Transforming our Community through Positive Change” at the Harwich Community Center. Do you know who most of the people there were? TEENS! Lots and lots of high schools students, all makes and models and primarily from the lower/middle cape. The keynote speaker was Steve Gross, director of Project Joy http://www.projectjoy.com/ – funny, accessible and totally an inspiration for those in the audience. Project Joy is a non-profit organization that uses play to strengthen and heal children whose lives have been deeply impacted by trauma. Steve, just back from Haiti, presented an interactive program with some of his moments from Haiti with kids/teens who have nothing and still carry that human spirit that says Connect! Seek Joy! Hope!. No, the talk wasn’t a pep talk but a very strong statement of the innate – that means it’s inside of you (and all of us) – to connect through play because we are social animals and how important that is during times of stress. This guy was fun! Check out the website….if you thought play was, well, just play….guess what, it’s even more fun and necessary than you ever thought. Then I attended 2 forums (among several offered) ‘We Will Rock You – getting Active Today in Local or Regional Change’ with State Rep. Sarah Peake, two reps of Harwich town government, Sarah Coxe, a legislative aide, and Andie Ramirez – Harwich HS, I think. Just talking about how getting involved starts, how you DO and CAN make a difference just by caring about some issue and acting on its behalf. Lots of good chat. AND I LEARNED ABOUT ‘CHALLENGE DAY.’ Have any of you ever heard of it? I guess down cape, Nauset & Harwich have had them. As one girl mentioned Challenge Day, a murmur of approval launched forward from many of the other teens in the group, so I asked ‘What is Challenge Day?’ Glad I asked and I won’t explain it here BUT it’s a good thing. Find out about it. Next I went to ‘A Day in the Life – Sharing Perspectives across Generations’ with a panel of elders and a panel of teens. Now, the panels are not up at the front…all the workshops were held in circle form, generally very large circles because this was a well-attended summit. And another guess what…NO ONE FROM SANDWICH WAS THERE. Well, there was me but I am not a teen…let’s get some Sandwich students there next year. Want to make a difference? Start small, perhaps, and find others….you’ll find lots of them through the Cape and Islands Youth Congress. Tap into it. Check this out…who’d ever thought books were violent and would battle each other for top page turner….